Social media’s proliferation means it is now a staple source of critical electronically stored information (ESI) in litigation and investigations. Because it is changing constantly on the backend, defensible collection practices are a moving target for legal practitioners. 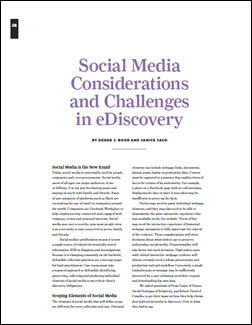 Case teams must take a nuanced approach to defensibly identifying, preserving, collecting and producing individual elements of social media to meet their client’s discovery obligations. Read more from Consilio’s Rob Fried and others in this article. Read the full article.